The French have great cooking style, as everyone knows, and one of their secrets is the effective use of herbs to bring out subtleties of flavor. In fact, there are three famous French herb mixes: fines herbes, bouquet garni, and herbes de Provence. Fines herbes is the most delicate of the three and is a blend of fresh parsley, chives, chervil, and tarragon. Many French cooks now add thyme to the classic four ingredients, and marjoram, savory, and watercress are sometimes also included. Fines herbs are mild and subtle and are generally used in egg dishes, on poultry, and in salads. For the French, fresh herbs are de rigueur for the fines herbes mix, but if you can't get all the components in their fresh state (fresh chervil is especially hard to find), you can use dried. This recipe is easily multiplied, but it is best to make only as much of the dried version as you will use within a month so it stays as fresh as possible. Combine the tarragon, chervil, chives, and parsley in a small bowl. Add this fresh fines herbes mixture at the end of the cooking process to preserve the flavor of the herbs. Combine the dried tarragon, chervil, chives, and parsley in a glass jar and seal tightly. When using a dried fines herbes, add the mixture toward the beginning of cooking time to give the herbs a chance to mellow. 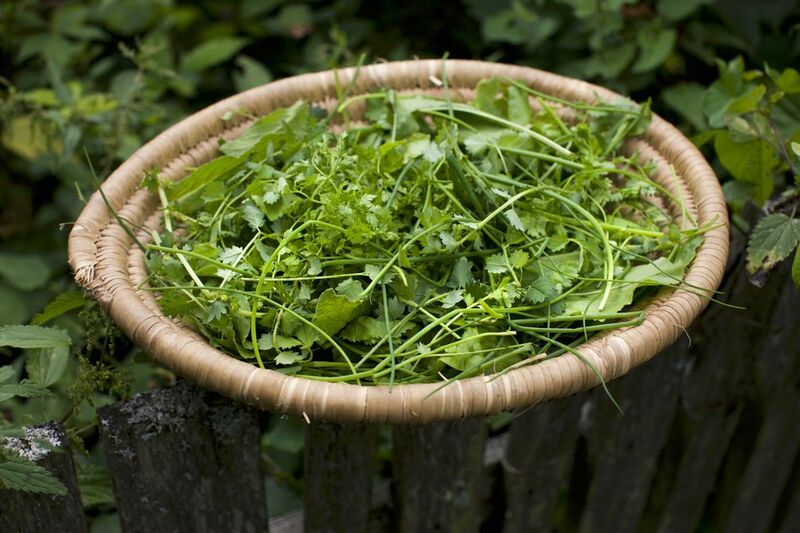 Chervil (pronounced sher-vil) is a cousin of parsley and is sometimes even called French parsley. This spring herb has a delicate, mild flavor similar to both tarragon and parsley with subtle hints of anise and licorice. The leaves of this herb resemble carrot greens and are somewhat frilly and curly. Unlike the other herbs in this French mixture, chervil is not readily available in the produce section of the supermarket. In addition to the fine herbes, French cuisine also features two other herb combinations. Bouquet garni is traditionally a mix of dried bay leaves, thyme, and parsley, but it sometimes also includes garlic and pepper. It's most often used in stews, soups, and braises and is usually wrapped in tiny cloth bags so it can be easily removed from the pot when it's done. Herbes de Provence is more intense than the other two mixes and is similar to Italian herb mixes, which makes sense considering the geographical proximity of Provence to Italy. The mix usually includes dried rosemary, marjoram, thyme, and savory, and often also features sage, fennel seeds, and tarragon. These herbs are commonly used as a dry rub to season grilled and roasted meats and as a seasoning in seafood and vegetable dishes. Herbes de Provence can also be used in a pinch as a substitute for Italian herb seasoning mix since it contains similar ingredients. Just add in a bit of oregano and maybe a dash of basil and you'll have the right flavor.